Comtech, a showcase of 35 AV manufacturers, will tour six cities in the Southwest from late September through November. The shows are produced by two commercial AV manufacturer’s rep firms, The Enright Company and Anew CT. 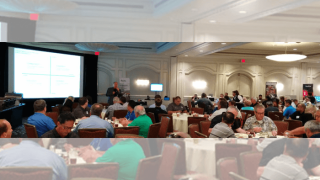 Most shows include product demos, luncheons or refreshments, guest speakers, and breakout training rooms. September 20: South San Francisco Conference Center 10 a.m.–5 p.m.
October 4: Burbank Marriott 1–6 p.m.
October 5: Phoenix Club, Anaheim 10 a.m.–5 p.m.
October 6: Star of the Sea, San Diego 1–6 p.m.
November 15: Scottsdale Hilton 10 a.m.–5 p.m.
November 17: Hampton Inn Tropicana (Dean Martin and Trop), Las Vegas 1–6 p.m.
For further information, contact The Enright Company, www.enrightcompany.com, 888.334.7773 or Anew CT, www.anewct.com, 303.662.8200.